PT Do Clones Dream of Electric Banthas? Discussion in 'Prequel Trilogy' started by Slicer87, May 15, 2016. Outside of the films, the conceit of the clones is that while they may look alike, sound alike and fight alike, they are each unique individuals with differing feelings, perspectives, and preferences. There is a nobility and a heart to these characters that is starkly at odds with the ways they’re portrayed in Attack of the Clones and Revenge of the Sith. In the films, they are largely depicted as automatons, flesh-and-blood droids, marching in perfect synchronicity and programmed like their mechanical progenitors to execute Order 66 with machine-like efficiency.While both interpretations are valid, I’ve always sided with the cinematic portrayal for a few key reasons that I believe make more sense thematically and tonally within the context of the larger saga. Honesty speaking, even as a kid from watching the prequels. I never got the impression the clones were supposed to be ''organic and detached robots''. Since we spend next to no time with them besides seeing fighting in a large battle. I had developed no notion on their characters from watching the prequels. Deliveranze and Iron_lord like this. I believe that is on purpose to show their inhumanity. Many bring up where Cody and Obi exchange friendly banter in ROTS as proof clones are fairly normal. Yet, they ignore how those scenes really show their coldness and automation. The way Cody goes from hot to cold like a faucet when he orders Obi to be shot displays their nature robotic. That is we see clones make decisions in the battlefield, but we never see them make any moral or ethical choices in the film, they just obey orders without question, which is why Cody turns so quickly and the rest of the clones. They have no ethics, as the article points out they never express doubt, they don't have bad feelings about things like the normal human characters famously express. They just charge right in similar to robots. This is why I agree with the article that the movie clones are expressed as organic robots in the venue of RUR and Blade Runner, except they are intentionally less than human rather than more. I simply prefer the film portrayal of them. This dehumanization has a secondary effect as well by casting a creepy pall over the entire enterprise; due to their unnatural origins, they are pseudo-monsters as depicted in the films, legitimately unsettling and disturbing. But from a moral standpoint, the absence of choice and individuality is the absence of humanity as well. A being forced to kill and die for a cause not their own but instead one that has been programmed into them is arguably not even legitimately sentient, let alone human. It makes you wonder: Cody has history with Obi-Wan; they refer to being in battle together previously. Is his banter with Kenobi a legitimate emotional response, a human connection indicating fondness, or is it programming as well? I swear I didn't write this. I think it would be interesting to hear Mia Mesharad 's perspective on this - possibly, that "they're arguably not even sentient" says more about the writer's perspective than it does about the clones themselves. I think the idea is the clones are never given a choice to fight for the cause or not, that choice is taken out of their biology, which is very similar to programming a droid. That they likely don't have normal human sentience. Thinking it over, the movie clones are very similar to the Frankenstein monster. In which the monster is given a abnormal criminal brain by accident due to Friz's bungling, while the clones are copied from a ruthless and criminal thug on purpose because the Sith desire those traits in their army. Granted we are talking about the movie portrayal of the clones, not TCW portrayal which takes a less sinister route in which there is still some hope for them. The movie version there isn't hope for them, they are more akin to thinking machines than limited humans. Of course it matters, whatever fondness the clones may have had for the Jedi wasn't lasting as they quickly turned on them without question, hesitation, or remorse, like turning a knob from hot to cold water. Such extreme emotional swings are not inductive of a normal or healthy personality or psyche which the Sith desired. This puts to question if Cody even really had a any fondness or is even capable of it, and that he was just feigning it. If you watch that scene, Cody expresses little emotional response while bantering with Obi who does most of the talking in the exchange along with expressing far greater emotion than Cody does. Cody even expresses negative emotions more strongly than positive ones when he orders Obi's death and ordering his men to find the body in a hateful and angry tone. Not in a tone of remorse or sorrow. Slicer, that's why I think it doesn't matter. 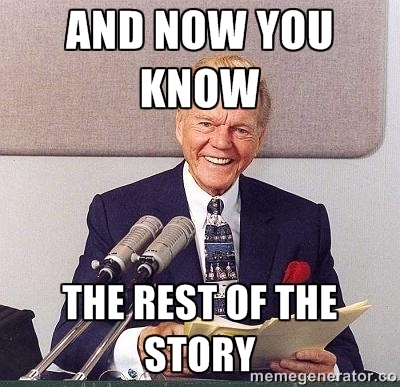 Whatever that moment was (legit emotional response, programming, anomalous individuality, etc), it made no difference whatsoever. Either way, Cody's cold execution cancels out any ideas of humanity/individuality in that scene, and I'm pretty sure that was the intention. I'm pretty sure we agree here. anakinfansince1983 and Slicer87 like this. The last part I agree, the article author probably would too. That unlike Blade Runner, the movie clones are intentional built to be less human, which makes sense for a clone intended for combat. Don't want those pesky emotions getting in the way of orders. Sorry about the double post Seagoat. Question: If clones had no personality, why do they decorate their helmets individually? The above image is from the article and one of the obvious details are the spikes around the two "thingies" of the helmet's "jaw". Unless these are part of the standard helmet design, it's a clear visual suggesting individualistic tendencies. Not to mention that Lucas had Obi-wan talk to Cody as if they were friends, invited the idea that the Clonetroopers weren't completely robotic. Weren't devoid of emotion and incapable of friendship. This is why TCW got away with what it did and Lucas didn't disagree. Cmndr_Thire and ConservativeJedi321 like this. In the films, only the commanders have unique armor, which is to designate them as commanders for the audience's sake, just as how in ANH Vader flies a unique TIE so the audience can easily identify him from a TIE piloted by a regular pilot. You also see this in other franchises with cyberman lieutenants having black head handles and cyber leaders have unique cone heads, despite cypermen stressing conformity. Same with the dalaks, they hate any kind of variance in their species, considering it an abomination that needs to be eradicated, yet their commanders oftern have unique armor casings and paint schemes which run counter to their ideology. In real life it is suicide for a commander to wear anything that easily identifies his higher rank as it makes him a prime sniper target (sinpers are trained to kill emeny commanders and officers to cause chaos). However all the rank and file clones in ROTS wear identical armor with only squad markings. In AOTC some clones had rank markings which soon gave way for squad markings, a reduction of individuality from AOTC to ROTS. ROTS shows clone individuality is an rare exception, not the rule like it is in TCW where almost every clone has customized armor. I find it amusing (and revealing) that Obi-Wan and the Jedi Council doesn't react with complete horror at the creation and raising of the clones like cattle, bred singularly for war, with basically little individual identity of their own. You might think most of us would react with horror. The clones are raised from a very young age there in the facility, trained to follow a singular way of life in similar identity-less uniforms where they put their lives in danger for 'the greater good' at all times. Then realize that it's the Jedi who are observing this. Of course they wouldn't react with horror. This is probably all too familiar to them. In my opinion, stuff like this deepens my appreciation for the prequels as you realize once again that, although the Jedi are the ones we like, they are not without their issues and horrors. It takes only one look at THX-1138 to see what Lucas is going for there. (And this clones stuff is in the morally grey world of Attack of the Clones no less). He's not a big fan of huge social institutions, hint hint. Those who unabashedly praise the Jedi while forgetting their shortcomings (which are not small potatoes, by any means) miss the point, in my opinion, of the prequels. Their relationship with the clones tells us a lot about the Jedi themselves. It also helps explain their reaction to the truly individualistic free radical of Anakin Skywalker. PS - Great title of thread and article, gotta love Blade Runner. Slicer87, Valiowk and AshiusX like this. Apparently the First Order's practice of training storm-troopers from birth was tactics inspired by the Jedi Order which the father of General Hux observed during his time with the Jedi. Albeit, Jedi don't kidnap children and actively seek the permission of the parents. This tradition still continues in the ST although it has been perverted. Albeit, Jedi don't kidnap children and actively seek the permission of the parents. Right -- if they didn't get the parents' permission, it'd be hard to argue in support of them at all. I guess what I mean is, even if they get the permission of the parents, the psychological experience of the Jedi that grow is up is going to be one in a sort of sterile environment where they train from a very young age in a rather uniform fashion -- not unlike the clones, I think. Well, not really with your last statement. 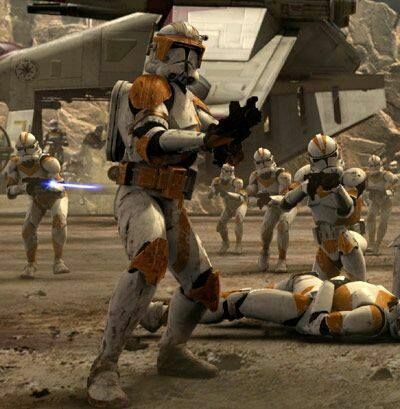 The only clones other than commanders that have unique armour designs, are either in special commando units (the Repbulic Commandos, Bad Batch or Arc troopers), or are part of Rex and Cody's squad. We know Anakin is more independent than most Jedi, and so it makes that sense that some of the men under his command have more free will. Even then, only about 7 regular clones have been seen with custom art, and that's Jesse, Kixx, Hardcase, Waxer, Boil, Dogma and Tup. Obi-Wan stared at the closest embryo, floating contentedly in its fluid, curled and with its little thumb stuck in its mouth. In ten short years, that tiny creature, that tiny man, would be a soldier, killing and, likely, soon enough killed. He shuddered and looked to his Kaminoan guide. "Come," Lama Su bade him, walking along the corridor. "Would you care to inspect the final product now?" the Prime Minister asked, and Obi-Wan could hear excitement in his voice. Clearly he was proud of this accomplishment. "I would like your approval before you take delivery." The callousness of it all stuck Obi-Wan profoundly. Units. Final product. These were living beings they were talking about. Living and breathing and thinking. To create clones for such a singular purpose, under such conditions, even stealing half their childhood for efficiency, assaulted his sense of right and wrong, and the fact that a Jedi Master had began all this was almost too much for him to digest. The tour took him through the commissary next, where hundreds of adult clones- all young men Anakin's age- sat in neat rows, all dressed in red, all eating the same food in the same manner. "You'll find they are totally obedient," Lama Su was saying, seemingly oblivious to the Jedi's discomfort. "We modified their genetic structure to make them less independent than the original, of course." "A bounty hunter called Jango Fett," Lama Su offered without any hesitation. "We felt that a Jedi would be the perfect choice, but Sifo-Dyas handpicked Jango himself." The notion that a Jedi might have been used nearly floored Obi-Wan. An army of clones strong in the Force? "Where is this bounty hunter now?" he asked. "He lives here," Lama Su replied. "But he's free to come and go as he pleases." He kept walking as he spoke, leading Obi-Wan along a long corridor filled with transparent tubes. The Jedi watched in amazement as clones climbed up into those tubes and settled into place, closing their eyes and going to sleep. "That is the key," Lama Su replied. "Disciplined, and yet with the ability to think creatively. It is a mighty combination. Sifo-Dyas explained to us the Jedi aversion to leading droids. He told us Jedi could only command an army of life-forms." ConservativeJedi321, Lt. Hija and xezene like this. Well we know they probably dreamed of Padmé, you know the Naboo Senator. Interesting that Obi was dead against it, but the other Jedi including Yoda were happy to lead them straight into battle.. 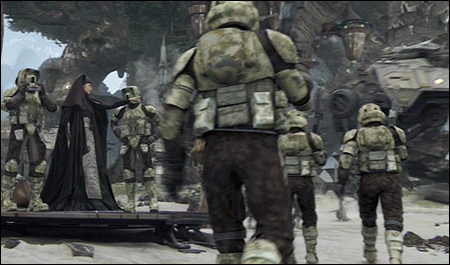 The EU has Yoda repressing shudders after the Battle of Geonosis (The Clone Wars: Wild Space) but concluding that the Republic's desperate need for an army may override the normal moral principles. According to Pablo Hidalgo. The whole ''micro chip angle'' within the clones is an idea from Lucas himself. Interesting discussion. For me, and we already have discussed it in another thread the problem of the clones is the moral problem of any war. The clones are metaphor of the ordinary soldiers or at least how the generals see them: as military units and not as real, individual human beings. They are only means of the war, figures in the chessboard, that's all. And of course, it is impossible to be another way, because if the chief commanders start to think about the real beings that they send to the death it would be impossible to think about everything else. 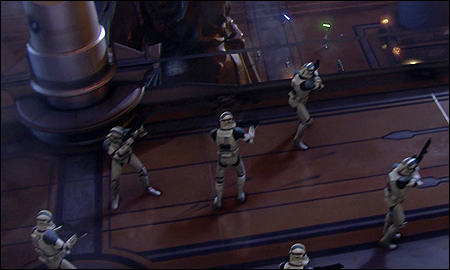 Of course here, in AOTC there is another problem: are the clones real living beings or are just something like creatively thinking droids as the prime minister of Kamino said? I think in the world of SW they are not considered as human beings but more as organic robots, because no one even Padme is terrified from the perspective to use clone troopers instead of droids in the war ( the war is terrifying but that's another point). And they are like robots not only because they look the same. The faculty of Kamino is a laboratory not a centre for giving a birth if I can say so. It is literally sterile: it can produce tools not breed a life. Generally, this is one of the most underestimated aspects of the prequels. Cmndr_Thire, The_Phantom_Calamari, xezene and 2 others like this.